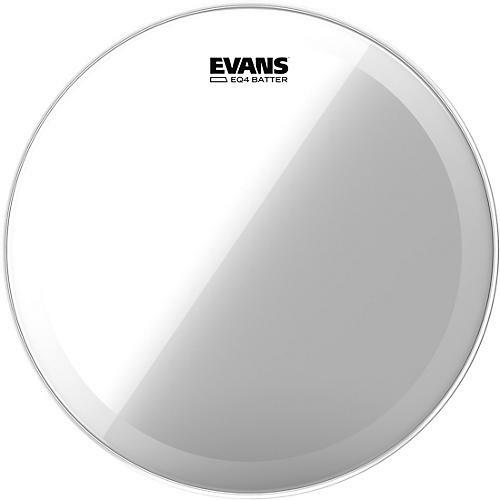 Open Box Evans EQ4 Clear Tom Drumhead for Floor Tom Conversion 16 in. For over 40 years, Evans has been a pioneer of drum head manufacturing and design. Known for innovative designs such as EMAD, EC2S, and the Hydraulic series, Evans drum heads are made in the USA in a state of the art manufacturing facility. Acquired in 1996 by D™Addario and Company, the global leader in musical instrument accessories, the Evans brand is synonymous with quality and consistency. Evans EQ4 series features a single ply of 10mil film. A fixed internal overtone control focuses the tonal response of the drum. This version features a tom hoop to accommodate metal flange counter hoops.